Stephen Collins Foster loved this area of the country which inspired him to write “My Old Kentucky Home,” which is performed at every Kentucky Derby. 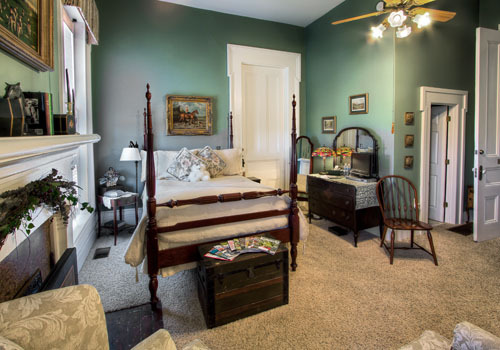 This room honor’s America’s first great composer and is embellished with oil paintings of Kentucky’s world-renowned Horse Industry. Two 9′ windows overlook the neighboring race horse farm and our all white flowering “Butterfly Moon Garden” which glows at night. The spacious Guest Room features a cherry four-poster, 7-layer Blissful queen-size bed, luxurious 600 thread count Egyptian Cotton Linens with Deluxe Featherbed Topper. Private Bath features a Walk-In Shower, Exclusive SPA Toiletries, and Extra-Plush Turkish Towels. Includes an Electric Fireplace for all-year enjoyment and Jacuzzi Tub for Two. 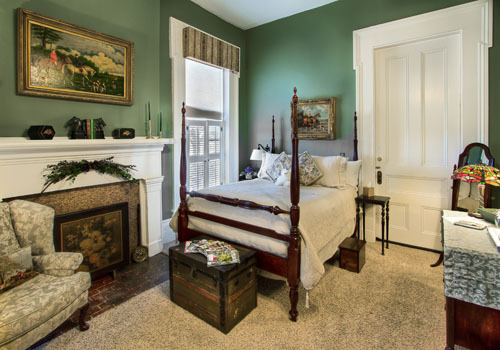 A wonderfully romantic room, well-suited for relaxing, rekindling, and renewal. 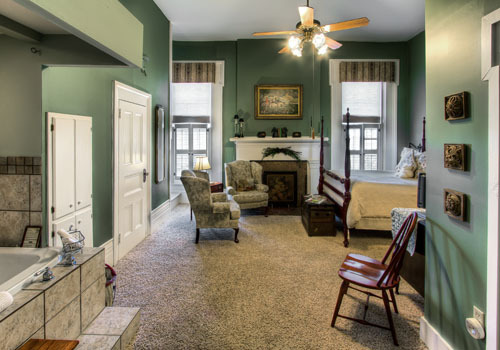 Adjoins the John James Audubon Room AND/OR the Lincoln Library Guest Room for 2 OR 3 Room Suite Accommodations – ideal for family and friends traveling together who are interested in having adjoining rooms.